Audi A5 Cabriolet Performance, Engine, Ride, Handling | What Car? You don’t have to drive the A5 Cabriolet very far to realise that it’s much happier cruising than charging along a winding road. That’s not to say it handles badly; body roll is well contained, the steering is nicely weighted and there’s lots of grip. What you won’t find is lots of information filtering up from the front tyres to the steering wheel or a sense of excitement. When you do relax and drive more sedately, the A5 Cabriolet is a comfortable companion with the optional adaptive dampers set to Comfort. Like the coupé, we’d avoid S line suspension, because this makes the ride firmer than necessary. We’d stick to 17in wheels for the same reason. With that in mind, we’d be tempted to avoid the most powerful four-cylinder petrol engine because it doesn’t feel an awful lot quicker than the entry-level diesel in the real world. We’d suggest the 3.0 TDI 218 V6 has the best balance of pace and frugality, plus it’s not too much more expensive than the four-cylinder 2.0-litre quattro diesel. A more powerful TDI 286 V6 is available, but we’d save our cash and stick to the 218. 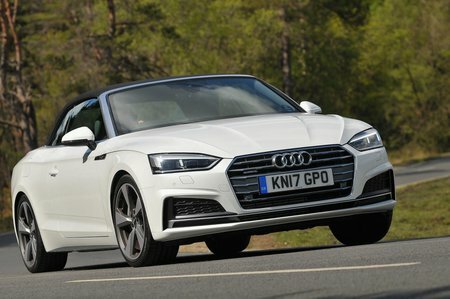 The S5 gets a 349bhp V6 petrol motor that’s quick, but rather thirsty. 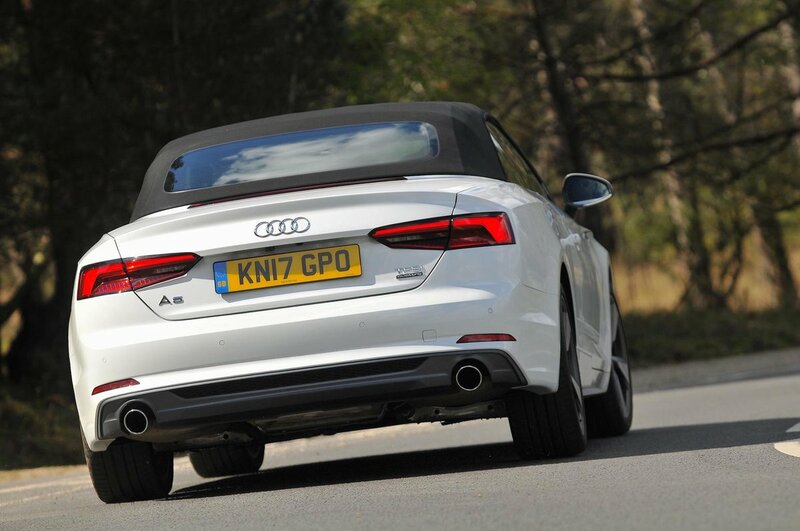 Given that the A5 Cabriolet is a cruiser, you’re unlikely to appreciate the extra shove in the back too often. Whichever engine you go for, it’s hard not to be impressed by the level of quiet. Even the entry-level four-cylinder diesel is remarkably hushed for this type of engine, with only a little bit of grittiness when accelerating and some vibration at low engine speeds slightly spoiling the experience. The petrol engines are even smoother, with a sporty edge when you rev them. As for the V6s, they have the best refinement, if you can stretch to them. Buffeting is kept to a minimum with the roof down, allowing you to chat to your passenger easily at 70mph, although a BMW 4 Series Convertible protects four passengers even better. An optional wind deflector is available, which obstructs the rear seats but keeps those in the front exceptionally well protected on the move. Our only complaint is that some versions we’ve tried generated an awful lot of road noise. Keep to the smaller wheels and tyres, and things should be more than bearable.